Nora Lighting Low-voltage 4-Inch remodel housing in white baked enamel finish, features 0.05-Inch one-piece drawn aluminum construction. It accommodates 50-Watt MR16 lamp that has voltage rating of 120-Volts/12-Volts. It is 5/8 - 1-3/8-Inch ceiling four high tension tempered springs mountable. It has cut out of size 4-3/8-inches. It measures 14-1/2-Inch x 4-7/8-Inch x 5-5/8-Inch. 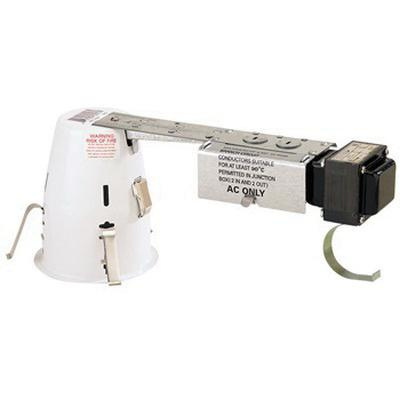 Circular bracket on low-voltage trim offers a secure snap-in hold and friction-locked aiming adjustment. It contains preinstalled gaskets to restrict airflow from room into ceiling plenum. Housing is cULus listed and meets ASTM standards.